Real Madrid travel to Celta Vigo on Sunday night, as they return to La Liga action following midweek success in the Champions League. 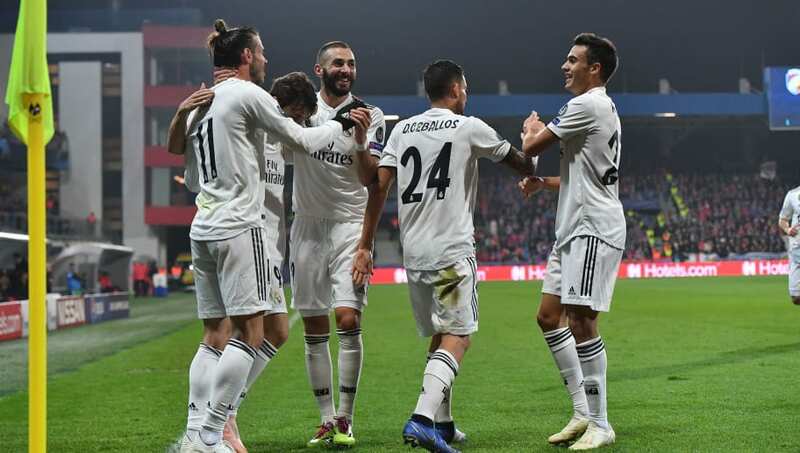 Los Blancos come to Galicia after an ​emphatic 5-0 win over Viktoria Plzen, which saw them go top of Group G. However they are far from the top spot in La Liga, sitting sixth in the table. On the other hand Celta are looking to respond to back-to-back draws with a historic win, which could see them overtake Real in the league table. The Celticos are 11th in La Liga, after a mixed season so far. With the two teams separated by three points, this could be a huge game for both. Real Madrid travelled to the Czech Republic without five players, and it looks like they'll travel to Vigo without them. Marcelo, Raphael Varane, Dani Carvajal, Mariano and Jesus Vallejo will not feature on Sunday through injury. Celta are missing two players for Sunday's game, with Mathias Jensen and Robert Mazan on the sidelines. There have been 42 meetings between Real Madrid and Celta Vigo, with Real winning 25 of them and Celta winning 12. The last time these two teams met was last May, when Los Blancos demolished Celta 6-0 at the Santiago Bernabeu. Real haven't lost to the Celticos in eight league games, scoring 31 times in the process. The last league victory Celta Vigo recorded over Real Madrid was in May 2014, when they defeated them 2-0. After a humiliating Clasico saw ​Barcelona thrash Real Madrid 5-1, Los Blancos knew something had to change. Julen Lopetegui was sacked the following day, and under interim manager Santiago Solari, Real have found their stride again. Since the derby defeat, they have won all three games, scoring 11 goals and conceding none. It looks like Real Madrid are back, and hoping to get back to the summit of La Liga. On the other hand, Celta's 4-0 trouncing of Eibar is their only win in nine games. The Celticos will be desperate for a win, but it will be a huge challenge against a rejuvenated Real Madrid side. With Real chasing a fourth straight victory and Celta looking for their first win of November, this will be an interesting match. If you looked at this game two weeks ago, it would be no stretch to predict a Celta Vigo win. However, Real Madrid have now been rejuvenated and are in top form, with Solari's men taking no chances. Real Madrid look to be the clear favourites for this one, as their fantastic recovery goes on.